I am frustrated to tears with this thing. I'm making a wall hanging for my cousin. I have it all charted out. I've done charts before and had no problems. But I just can't get this thing right and I can't figure out why! The rows don't match up with the rows before. I'm counting out the stitches as I do them and marking them off on the chart, but it still doesn't match up right. I have torn this thing apart three times already and I really don't want to tell my cousin that I can't do this. I recently messed up by starting a row from the wrong side of the chart, went back to starting the row at the right edge when i should have started it from the left.....i don't suppose you have done something like that? I've definitely been alternating the rows. Plus I was only on row two last time I pulled it out and row three this time. Despite what some people think, it is alot harder than it looks. I learned to do it from Carol Ventura (the Queen of tapestry crochet). Working in the round ( a purse, basket, etc..) is fairly easy once you know the stitches, but doing flat work is for advanced crocheters as the 2nd and alternating rows are NOT done the same as regular crochet. About the 4th row down is a video on doing flat work, hopefully this will help you figure it out. Sometimes you just need to put it down and walk away for a little while. I understand wanting to 'get it' but once we get frustrated 'getting it' becomes harder. Single crocheted stitches do not line up vertically . 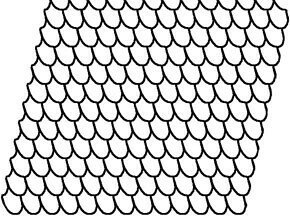 You need to use a graph paper that is specifically designed for making tapestry crocheted items. The only place I know of to find the papers is at Carol Ventura's Yahoo Tapestry Crochet Group. There are papers for in the round left and right handed. There is also a special graph paper for making things that are flat. The worst part is, I've done this before. I made a great big wall hanging for my son's school that had a picture of a cougar and it turned out perfectly. Maybe because I didn't count so carefully - I looked at the row before and used it as reference instead of counting. Maybe I'll do that again. [quote=You need to use a graph paper that is specifically designed for making tapestry crocheted items. The only place I know of to find the papers is at Carol Ventura's Yahoo Tapestry Crochet Group. The same page also has a thumbnail for flatwork graph in the "images" section on right side of the page. Your previous work of the cougar ghan sounds great, did you post a pic of it? Here is my Ravelry page for the cougar. It turned out totally awesome. I donated it for a fundraiser. My question is: Did you actually flat tapestry crochet this? It looks like you did more of a "graph" technique. Flat tapestry crochet can be quite tedious. The unused yarn is carried thoughout the entire piece. And the flat graph paper is designed for the unique way that single crochet stitches line up on top of each other. Flat tapestry crochet is done in 2 ways: You can crochet across the piece from right to left, being sure to carry the unused color(s). Then on the the next row you will have to make a decision. Wroking from the left side of the piece, you can keep the right side facing you and, using your non-dominant hand (mine is my left hand,) read the graph from the left to the right and make your stitches. If you are unable to do this, you can use your dominant hand, but you will have to turn the piece over and reverse single crochet (still working the from the left to the right) all of the stitches across the row. All of the odd numbered rows would be single crocheted and all of the even numbered rows would be either reverse single crocheted or single crocheted using your non-dominant hand. I will admit.... using your non-dominant hand DOES TAKE PRACTICE! The way I did the cougar was do the odd rows right to left and the even rows left to right (or the opposite, I forget which way you're supposed to do it) and just regular sc the whole thing. I didn't carry the yarn through the whole thing, I just carried it when I had to.